“I don’t think he’ll be as good as Cotto was…I don’t know nothing that he has that could really cause Floyd a problems. 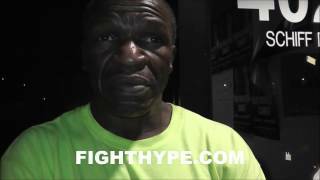 I mean, that’s the honest truth…I don’t think it’s going to be hard as everybody saying it’s gonna be,” stated world-class trainer Floyd Mayweather Sr., who shared his thoughts on undefeated jr. middleweight champion Saul “Canelo” Alvarez ahead of this Saturday’s showdown. Check it out!